Allows the Broodling Hero to violently propel itself forward to strike its target, dealing heavy damage, stunning it, and applying max venom stacks. Level 1: Deals 15 (+1.5/lvl) damage, 0.5 second stun. Level 2: Deals 30 (+3/lvl) damage, 1.5 second stun. Level 3: Deals 45 (+4.5/lvl) damage, 2.5 second stun. Allows the Broodling hero to sneak into the shadows, becoming passive, cloaked, collisionless, and gaining increased movement speed. The broodling stalks it's next victim, dealing increased damage on its next attack. Grants the broodling regenerative armor, increasing its durability as it takes damage. Stacks 5 times. Max +1 Stack per 0.75s. Stacks last 6 seconds. Level 1: +0.5 Armor when attacked. Max +2.5 armor. Level 2: +1 Armor when attacked. Max +5 armor. Level 3: +1.5 Armor when attacked. Max +7.5 armor. Allows the Broodling hero to inject its victims with a stacking venom every time it auto attacks, slowing the affected unit's attack and movement speed by a percentage. Maximum of 10 stacks. The Broodling Hero launches a spore cell at target area, affecting enemy units in a radius of 2.5 for 2 seconds dealing periodic damage over the duration. At the end of the duration, there is a chance the affected unit(s) will spawn a pair of spawnlings. Brood Cell also reveals cloaked units. Level 1: Deals 35 (+3.5/lvl) damage over the duration and has a 35% chance to spawn a pair of spawnlings. Level 2: Deals 70 (+7/lvl) damage over the duration and has a 70% chance to spawn a pair of spawnlings. -Sudden Strike damage lowered from 20/40/60 -> 15/30/45. -Reduced Molt spawn rate from 4 per second to 2 per second. -Brood Cell debuff is now paused during stuns instead. -Spawnlings are always invulnerable for 1 second upon spawning. Timed life decreased from 6 -> 3. -Sudden Strike no longer stuns. Damage increased from 20/30/40 -> 20/40/60. -Brood Cell damage decreased from 36/72 ->20/30/40. Energy Cost decreased from 60 -> 40. Cooldown decreased from 20 -> 10. -Brood Cell no longer roots and reveals. Instead, it applies an 6 second debuff to all units. Units moving spawn 1 spawnling every 0.2 seconds. Units will always generate spawnlings when stunned. -Mitosis Plating replaced with Molt. Rapidly sheds 4 spawnlings a second. 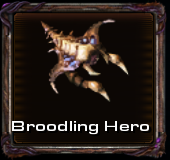 While the skill is active, the broodling hero is immune to slows. Lasts 4/6/8 seconds. Cooldown 20. Energy Cost: 60. -Venom replaced with Shred. The attacks of the broodling hero and spawnlings reduces target's armor by 60/80/100% for 8 seconds. When attacking units below 50% health, gains 30/40/50% attack speed. -Shroudling duration increased from 5/7.5/10 -> 15/30. Cooldown increased from 20 -> 30. -Shroudling movement speed bonus rescaled from 15/25/35% -> 20/35%. No longer deals bonus damage upon exiting shroudling. Exiting shroudling now stuns damaged units for 1.5/2 seconds. - Broodling rework. Brood Cell has now been made into the hero's ult and Mitosis Plating has replace it as its new W.